This was my second time reading this beautiful story. The first time, I was in high school and many of Francine River’s novels were making the rounds between all of my girl friends. We devoured her books. They spoke to our hearts and minds. Few spoke more to me than this book. It wasn’t until I read The Mark of the Lion trilogy later in my college years that I found novels that could manage to top this one in the Christian fiction arena. Redeeming Love is the story of Christ’s love for the church. It is also a story like that of Hosea and Gomer in the Bible. It is a story of faith, trials, sin, and forgiveness. But, before you dismiss this story just because you’re not a Christian, consider giving it a chance. Angel is a prostitute who has suffered unspeakable horrors in her life. All the hardships she’s faced have made her cold and hard with a broken heart no one can see. Michael is a God-honoring farmer who longs to marry her and rescue her from her world of hurt and torment. He spends his money merely to talk with her and woo her away with him. She ends up going with him eventually, only to run away and repeatedly fall into her old life. Michael forgives her again and again, though it tears at his heart. Eventually, Angel’s frozen hear begins to thaw in her chest and she grows to love Michael for his kindnesses to her. As time passes, she realizes she must put his interests above her own. Healing comes only when she begins to understand she has made Michael her savior. God’s still small voice eventually passes through the veil of hurt, pain, and bitterness she has shrouded herself with. After I put down this book this afternoon, I burst into tears. It was such a beautiful, tender, hard story to read. It touched my heart and spoke to my spirit, constantly reminding me that God has forgiven me and taken me back after every unspeakable deed and sin in my life. He longs to love us as Michael showed love to Angel. However, Rivers does a great job of reminding us that even as pure and holy as Michael’s love for her was, it was no match for God’s love–which is what Angel needed all along. Again, even if you’re not a Christian, give this book a chance. It is the epitome of true love being shown to another person. Also, for historical fiction buffs like me, this is a really interesting setting– California during the Gold Rush years. This story will change you and speak to you. Give it a chance. If you are a Christian, get a giant box of tissues and be ready for LOTS of prayer surrounding the words in this book. Don’t be surprised if you find yourself tearing up and whispering prayers to Our Lord throughout your reading time. Do yourself a big favor and go out to your library or bookstore and give this one a read. You’ll most likely devour it in a few days. Warnings: There are some very difficult topics, images, and situations in this book. 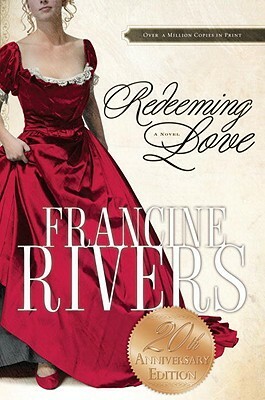 It is unlike any Christian fiction novel you’ve likely read before. It is DEFINITELY rated PG-13.